Would you like to create an additional source of income, simply by letting your customers, colleagues or friends know us? Join our affiliate program and earn 10% commission on purchases which can generate. turboSMTP Affiliation Program can create a channel of steady income, without you doing anything. You can earn each month, just by letting your friends or colleagues know us, through an affiliate link. Now you can advise your customers about our service. They’ll resolve once and for all their email delivery problems, you will earn a percentage of every purchase they’ll make. If you are a web agency, web service provider or technology company, or any business that wants to provide an extra service to its customers, our affiliate system suits you. You don’t have to do anything. Only provide the affiliate link to your customer: we’ll do the rest. We will assist your clients, following them step by step setting up their email client. Become a turboSMTP Affiliate is very easy, quick and most importantly FREE! 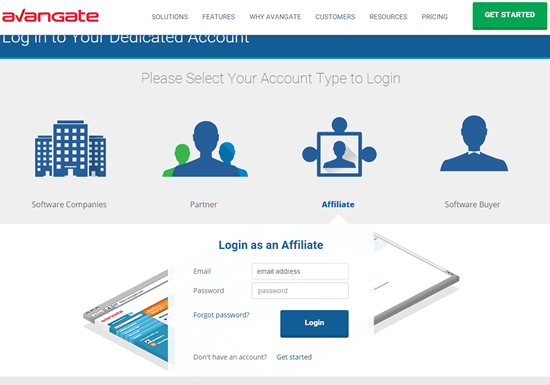 Go to the Avangate Affiliate site, register and wait for approval via email. Send us your request by clicking below on “request partnership”. 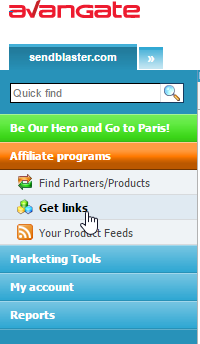 Once you receive the approval from us, you can start making money with your affiliate links. We offer you the ability to create links to purchase prepaid, annual and monthly plans. 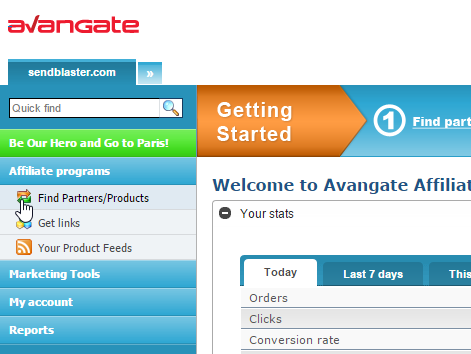 Click on “Get Links” at the top left of your Avangate dashboard. At this point you can create an affiliate link: The system will generate the same affiliate URL whether you choose “Monthly Subscription”, “Yearly Subscription” or “Prepaid Credit”. So for your convenience, you can directly use “monthly subscription” that appears by default (see the image above). Your customer can purchase any product available, with the link generated. Now you have to click on the “Link Type” drop down menu. 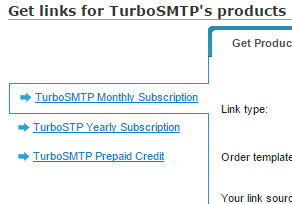 Vendor website: If you want to direct the link to turboSMTP homepage. Custom URL: to create links to any turboSMTP web page that you want. For example, you can create a link that points directly to the pricing or registration page and so on. After you choose, in order to create affiliate links, you must click on the button “Generate link“, then copy it from the screen below. Promote turboSMTP by placing text links on your website or one of the available custom banners.Every time someone clicks on a link or a banner, signs up and makes a purchase on turbo-smtp.com, the sale is recorded and you are immediately credited the commission! When creating links, always uses the last two items on the list, Vendor website and Custom URL. So your customers’ transactions will be tracked correctly. And don’t look at the amounts displayed under “product info”: those are general values set by the system. They won’t be calculated for your commissions. Payments are made after taxes. All totals are calculated at the end of each month and paid at the end of the following month. Payment method: wire transfer or PayPal. For any information on our affiliate program, you can check our Affiliation FAQ section, or contact us. Qué tipo de usuario es usted?